What do ribosomes look like? How small can magnetic storage devices get? Can Moore's Law hold forever? Where do toxic metals go once they've contaminated the soil? What's the best way to keep a baby dry? 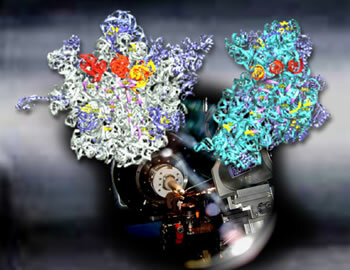 A Center for Structural Biology beamline analyzed the subunits of the ribosome. These are a tiny sample of the many questions that have been addressed by researchers through the use of Berkeley Lab's Advanced Light Source. 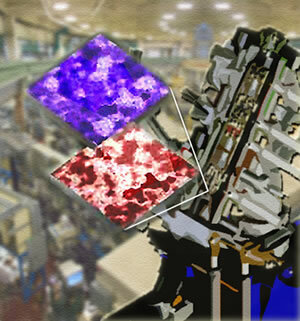 In each case, the unique characteristics of specific ALS beamlines and experimental facilities provided answers that could not have been obtained anywhere else. For example, a team of researchers led by Harry Noller of the University of California at Santa Cruz used the protein-crystallography facilities at the ALS's Berkeley Center for Structural Biology to obtain the first-ever high-resolution look at a ribosome, a virus-sized organelle that is vital to protein synthesis. The first published ALS images of the ribosome were resolved to 7.8 angstroms and showed the ribosome to consist of two asymmetric subunits spanned by an RNA-protein bridge. Subsequent images boast a resolution of 5.5 angstroms. The PEEM2 microscope compared antiferromagnetic domains and crystalline structures of thin films of lanthanum iron oxide. The PEEM2 microscope, an ALS spectromicroscopy facility, was used to produce the first images of the domain structure of an antiferromagnetic film, a type of material critical to advanced magnetic devices such as the read heads of computer hard-disk drives. PEEM2 images showed that the alignments of tiny magnetic domains in lanthanum iron oxide, each only a few hundred nanometers in size, correspond to a particular orientation of the material's crystals. "Moore's Law," Gordon Moore's prediction that the density of circuit elements on microchips will double every 12 to 18 months, has held true for the past 30 years. But if it is to continue to be the law for computer chips, new fabrication techniques will be needed. At the ALS, a consortium of industry and government labs has constructed the first prototype machine for measuring and even printing test computer chips using extreme ultraviolet (EUV) light. Microprocessors based on this technology will operate ten times faster than today's most powerful chips and are expected to come to market by 2007. 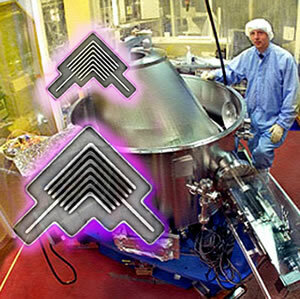 The EUV interferometer on beamline 12.0.1 measures optics and prints test chips for next-generation microchip steppers. Effective environmental remediation requires basic chemical information at the molecular level about contaminants. Using the Molecular Environmental Science facilities at the ALS, a team of French researchers was able to identify the three main chemical forms taken by zinc-containing compounds in contaminated French and Belgian soils located near decommissioned smelters. This finding holds great promise for future toxic metal studies. Disposable baby diapers are a $20 billion a year industry, and the search for the perfect bottom sponge has been a driving force in polymer research. Scientists from the Dow Chemical Company used a scanning transmission x-ray microscope at the ALS for a detailed study of "superabsorbent polymers" that are able to soak up lots of liquid. The information obtained was used to help guide the design of a new superabsorbent polymer fabrication plant. If these examples have whetted your curiosity, click for lots more about these and other scientific highlights at the ALS.